(SALT LAKE CITY)—While fine particulates, nitrogen dioxide and other components of air pollution can seriously harm the lungs of those unlucky enough to breathe them, it turns out those toxins might also contribute to an increased risk for suicide. Surprisingly, though, the risk was highest during the spring and fall, and not the winter months when air inversions blanket the valley and cause serious problems for people with sensitive lungs or other conditions. University of Utah researchers examined the records of more than 1,500 people who committed suicide in Salt Lake County, Utah, between Jan. 1, 2000, and Dec. 31, 2010, and found that the odds of committing suicide were 20 percent higher for individuals exposed to increased levels of nitrogen dioxide in the three days before they ended their lives. Similarly, individuals exposed to high concentrations of fine particulate matter (PM2.5) in the three days before a suicide experienced 5 percent higher odds of suicide. Suicide is the 8th leading cause of death in Utah and the 10th leading cause of death in the nation, according the U.S. Centers for Disease Control and Prevention (CDC). The agency also says Utah has the 7th highest suicide rate in the country. Bakian will present her findings on Friday, April 11, 2014, at the annual conference of the American Association of Suicidology in Los Angeles. She and her colleagues conducted the study using records from the Utah Department of Health’s Office of the Medical Examiner. 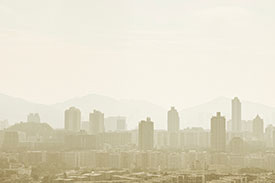 The researchers had hypothesized that suicides would increase during the Salt Lake Valley’s air inversions in winter months, but the data told a different story: the risk for suicide went up when PM2.5 levels were higher during the spring, increasing by 28 percent, while the odds of committing suicide during periods of higher concentrations of nitrogen dioxide increased by 34 percent during the spring and fall. Studies in Korea and Taiwan have found a correlation between air pollution and suicide risk, but Bakian says this is the first study she knows of to address that question in the United States. In future research she plans to use a seed grant from the University of Utah to examine the relationship between suicide and air pollution in greater depth, looking at factors such as socioeconomic status, genetics, and the presence of physical and psychiatric conditions. Perry F. Renshaw, M.D., Ph.D., M.B.A., U of U professor of psychiatry, is the senior author on the study.